Let’s face it, scaffolding is a temporary structure used to support people and material in building sites for construction, repair or other work. The accent is on the word temporary. While this structure is eventually pulled down, it must by its very nature, be sturdy and safe. After all, it is for supporting people (and materials/tools). Hence scaffolding is primarily used during the construction stage or for repair work. So, is it worthwhile investing in scaffolding through purchase, or is it better to hire? If you’re in the Sydney area, Aztex Equipment can assist you with your scaffolding hire needs. Our scaffolding range offers both mobile aluminium towers and steel scaffolding. Our aluminium towers are ideal for light to medium duty use. They are easy to erect and lightweight for easy transport and stacking. Working platforms range from 1.2m, 1.8m, 2.4m & 3.0m long. Frames are available in single platform wide (700mm), two platforms wide (1300mm), three platforms wide (1900mm) and four platforms wide (2500mm). The frames come in both 1.0m & 1.5m heights. For heavy duty needs, we recommend our steel scaffolding — from 225kg – 675kg depending on duty classification as specified in ASNZS 1576.1. Bays are 1.8m long. Frames are three planks wide (700mm) & five planks wide (1200mm). Frames are also 1.0m & 1.5m high and planks are available in 2.4m, 4.2m and 4.8m lengths. Captive planks are 1.8m long. Our scaffolding is ruggedly built for the toughest requirements and is made to Australian Standards. They are also designed for DIY erection (for towers where a person could fall 4.0m or more, a qualified scaffolder must install). 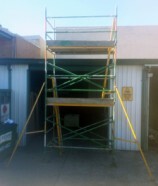 We also have mobile scaffolds with wheels for easy movement around worksites. All our scaffolding components are easy to stack and are also transportable. Aztex Equipment provides delivery throughout the Sydney area. Our rates for hire and delivery are very reasonable, extremely competitive in today’s market.